We celebrated Thanksgiving last night and it was my first experience of how people celebrate Thanksgiving in America. 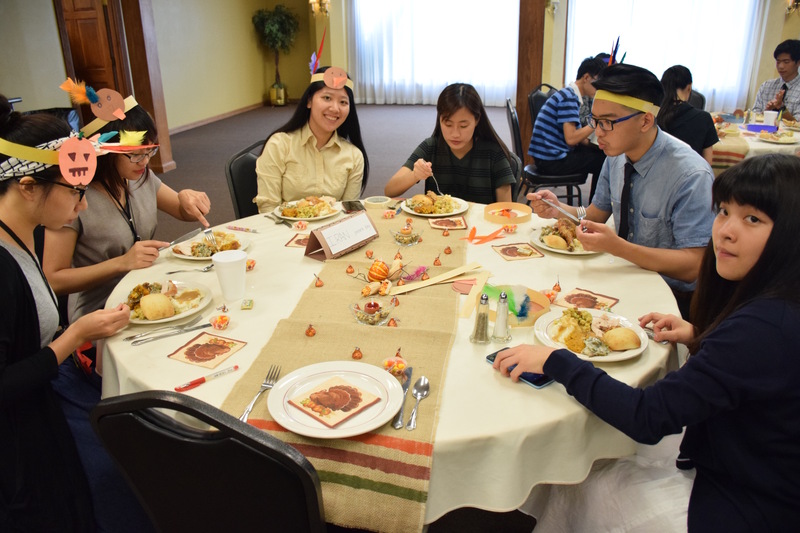 First, we made our own turkey hat and wore it during the dinner. While we were eating, we watched a video about Snoopy celebrating Thanksgiving with friends and family. For Thanksgiving dinner, we had mashed potatoes, turkey, steamed pumpkin, beans and pumpkin pie. I am not such a fan of pumpkin, though. After the meal, Rebecca shared a story of a man who was a refugee from Iran. The story was touching and it made me think if I had been thankful for the Savior. Then we had some activities related to Thanksgiving. We played two games; one was about biting apples from a box of water, and the other one was jumping in a bag. I didn’t join the game because my foot was injured, but it was hilarious to watch others play. I wish we celebrated Thanksgiving like last night in Taiwan. This entry was posted in VOICE 2016 and tagged Thanksgiving by the VOICE journal. Bookmark the permalink.